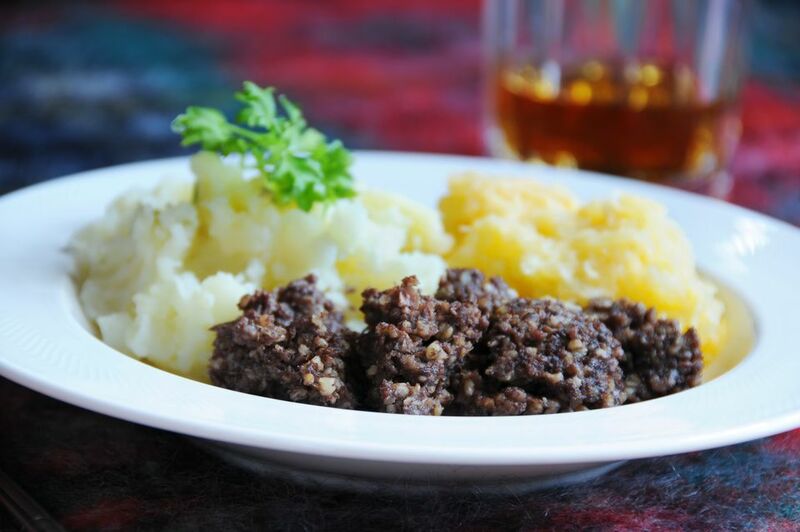 There are a couple of special celebration nights in Scotland of Burns Night and Hogmanay when the traditional dish of haggis, tatties, and neeps are served. This classic Scottish dish may have an odd sounding name, so for those who don't know what they mean tatties are potatoes, neeps are turnips, and haggis is the savory pudding made from sheep organs and oatmeal. There can be no Burns night supper without a dish of traditional haggis, tatties, and neeps. The haggis makes or breaks this recipe, so make sure you buy a good quality Haggis, be it a traditional meat or a vegetarian one. Cook the haggis first by placing the haggis in a large pot and cover with cold water. Cover the pan with a lid, bring to the boil, then reduce to a simmer and cook for 40 mins per 1lb / 450 grams. While the haggis cooks, cook the potatoes and turnips. Place the potatoes in a large saucepan, cover with cold water, add a pinch of salt, cover the pan with a lid. Bring the potatoes to the boil, reduce to a simmer and cook until tender (approximately 20 minutes). Drain the potatoes and keep to one side. Add half of the butter and half the milk to the pan the potatoes were cooked in. Melt the butter and warm the milk, add the cooked potatoes and mash. Add the nutmeg and stir well to create a smooth, creamy mash. Place the turnips in a large saucepan, cover with cold water, add a pinch of salt, cover the pan with a lid. Bring the turnips to the boil, reduce to a simmer and cook until tender (approximately 20 minutes). Drain the turnips and keep to one side. Add half of the butter and half the milk to the pan the turnips were cooked in. Once cooked remove the haggis from the water. Place on a serving dish and cut it open with scissors or a knife and serve with the tatties and neeps alongside. And to drink, a wee dram of Scotch whisky would be traditional. Always check the instructions on your shop bought haggis carefully. These instructions here are just guidelines. Cooking times will also depend on whether you are using a meat Haggis or a vegetarian version, as the meat-free takes less time.